After breakfast, we headed down to the tourist desk where we bought the ticket for the fast ferry to Amed. The tout just took us along to the office of Freebird Express, the company we picked to use for the crossing, which was tucked away off the main drag. We probably could have booked direct with them, but we got a decent price anyway, so we got checked in and then took a seat down near the beach. We had a little wait for our ferry to arrive, the place was mobbed with multiple company’s ferries loading and unloading luggage and passengers, but this must be a daily ritual for this busy little island. Our ferry arrived about 20 mins late, and once we got loaded we set off. 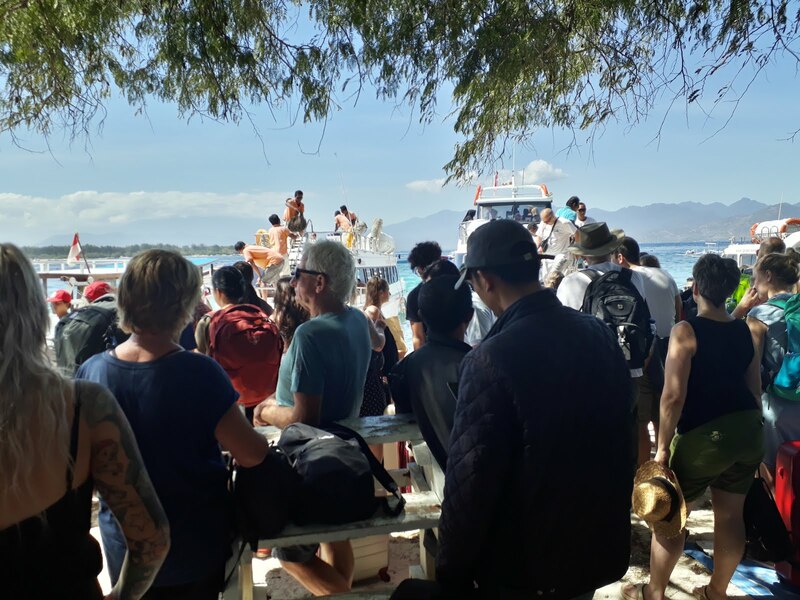 As what is becoming standard procedure on our travels, a simple description of the ‘Fast ferry to Amed’ turns out to be a bit vague as we started heading the opposite direction, to Gili Air. Again, we offload and unload passengers/luggage, and set off again. Yet again we continued in the wrong direction, and after a quick check of Google Maps, we were heading to the mainland of Lombok, to repeat the process, before we eventually set off towards Amed about an hour or so later than expected. We sat out the back of the boat again, next to the 5 powerful 300cc Honda engines, and we were soon speeding across the sea, as water splashed all over the back area for most of the hour or so crossing, soaking everyone. 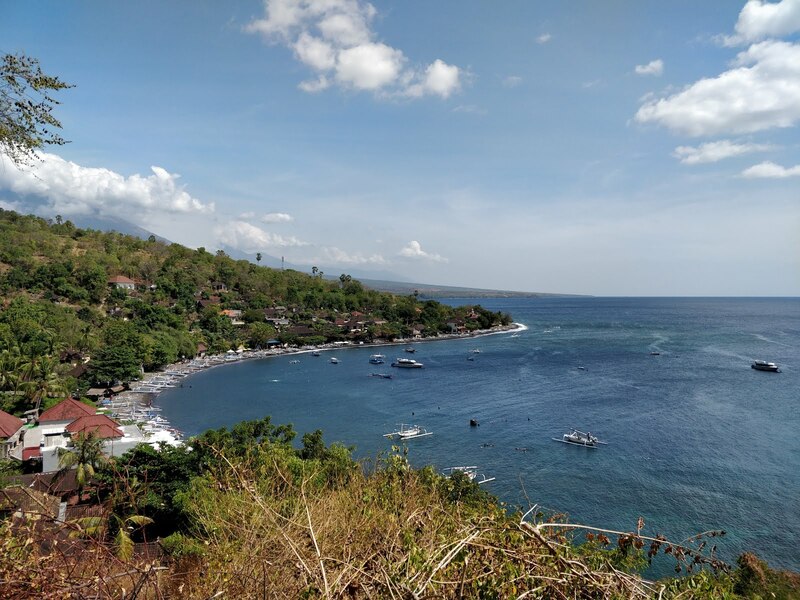 When we arrived in Amed, it was an easy 10 minute walk along the small narrow road that runs along this North East coastal area of Bali, which consists mainly of Warungs, tourist shops and dive centres. Our guest house for the next few days was the Three Brothers, with beach access in a large villa which included the standard breakfast in Indonesia of eggs, toast and fruit salad. We decided to go snorkelling off the beach late afternoon, it was low-tide though and getting in and out to the reef was tricky. The first evening we just had a beer on the black sand beach and watched the sunset over the bay with Mt. Agung as the backdrop, which was stunning, and she even gave off a little smoke for us to see. We then went to a small Warung just along the road for dinner, and we had an amazing couple of local Indonesian dishes. The next day we had booked a couple of scooters from our guest house, so we decided to go out for the day snorkelling at various spots along the coastal road. The road eastwards from our guest house was a wonderful winding road that hugged the coast, with small villages dotted along the road and some fabulous views as the road went higher. Our first stop was at Lipah Beach which was a black sand beach with sparkly sand, we went out for a little bit but wasn’t much to see. Then we went down the coast a bit more to snorkel over a small Japanese wreck, but the visibility was poor, and we didn’t see much. Finally, we went back up to Jemeluk, the beach next to the one we are staying at, and this had the best snorkelling out of the 3 places. We managed to see a small Moray Eel and various other fish, plus some weird little underwater shrine and Sadie got followed by a small crab (which we think attached itself to her as it seemed to appear when we got back to the beach!). At night, we went back along the coast to a place called The Grill, which was run by an eccentric old Aussie lady, and I had the most amazing 3 course dinner as a treat. I had the Pork Ribs which were the best I’d had since being away, whilst Sadie had Sesame crusted Tuna. The following day we went for an early morning snorkel from our beach as the tide was high but didn’t really see anything exciting. 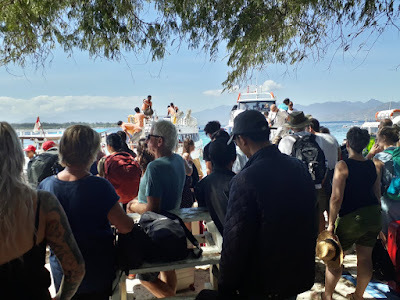 I think we had been spoiled whilst on Gili T, and by this time the underwater camera Jane had given us in Tioman had started to play up, so sadly we decided it had reached its end of life, so we donated it to the guest house to see if they could fix it. As we were not doing much more snorkelling for the foreseeable as we were heading inland for a while, we also donated our snorkel sets to them too. That day we took off up the coast this time on the scooters, and did plan to try get to see Mt. Batur, but the heat of the day combined with a very boring road, we turned around after an hour and just headed back to the guest house, but not before stopping at probably the worst Warung in Bali for lunch. I ordered a prawn cocktail salad which consisted of a whole pineapple chopped up, 4 frozen prawns on a huge bed of lettuce with the blandest Marie Rose sauce I’d ever tasted. Sadie opted for a cheese, bacon and onion Jaffle (toastie) which came just on a small plate, no garnish or anything with it. The food that night made up for it as we went to a highly rated Warung called Amed Sea View Restaurant and had 2 amazing seafood dishes, I opted for Grilled Squid which was huge and delicious whilst Sadie had Grilled Barracuda. 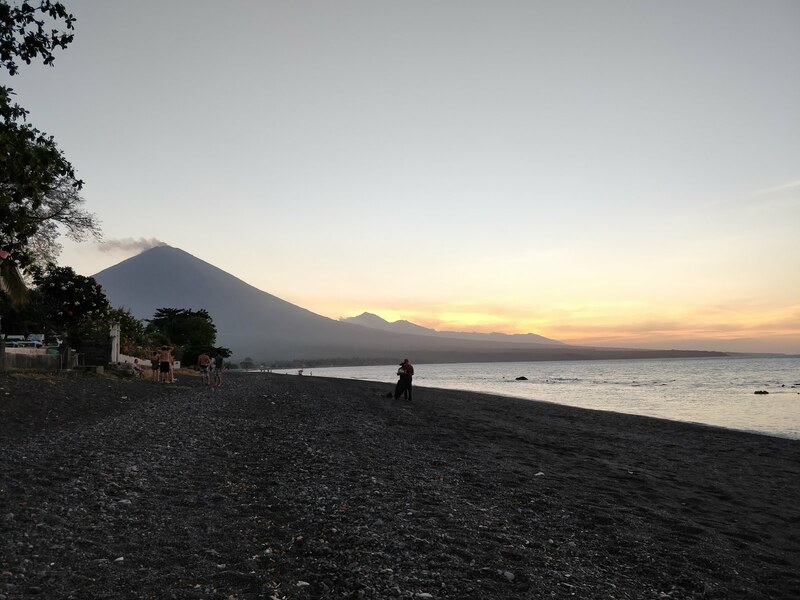 We had booked the Perama Tour shuttle bus to take us from Amed to Denpasar to the airport the following day, as we had booked 1 night there before we caught our early morning flight to Jakarta. This was the cheapest option for the 3-hour journey, and as standard it didn’t go as we expected. 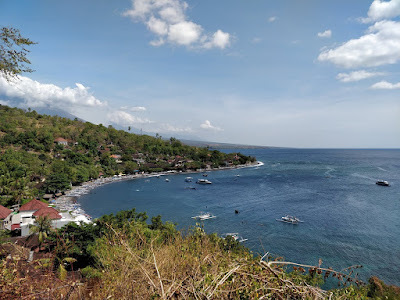 We made several detours for pick-ups along the way, had 2 short break stops and then had to change minivan at Sanur, before we then got thrown out outside the airport as I said we didn’t actually want to go to into the airport! So about 2 hours later than we thought, we checked into our hotel for the night, which was actually next door to the one we stayed at the night before we flew to Flores, but far better for a similar price. We then went out to drop my trousers to get repaired at some tailors I found on Google, which was a little tiny room at the front of someone’s house, so I explained to the lady there I needed a new button sewn on plus a small rip repaired. She told us to come back in an hour or so, we went to grab some food at the supermarket and had a coffee. On the way back to the hotel, we stopped to collect the trousers, which had been lovingly repaired with a stud placed instead of a button, and the rip had been repaired so it’s hardly noticeable. This cost me a whole £1, total bargain! That night we had an amazing Satay meal set from a local Warung, then I wasn’t feeling too good so didn’t go to watch the World Cup final as planned, and just got score updates on the laptop. The following day we got our flight to Jakarta, where again we had a hotel near the airport booked for the night, as the next day we left Indonesia to fly to Ho Chi Minh City in Vietnam. 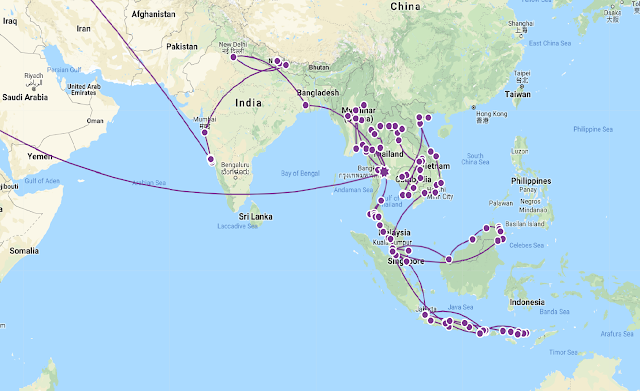 We booked the Ibis Budget Hotel, which despite being a worldwide brand, was well below par in both cleanliness and available breakfast… oh well we had a long day of travelling to look forward to as we had to do a quick stopover in Kuala Lumpur too!